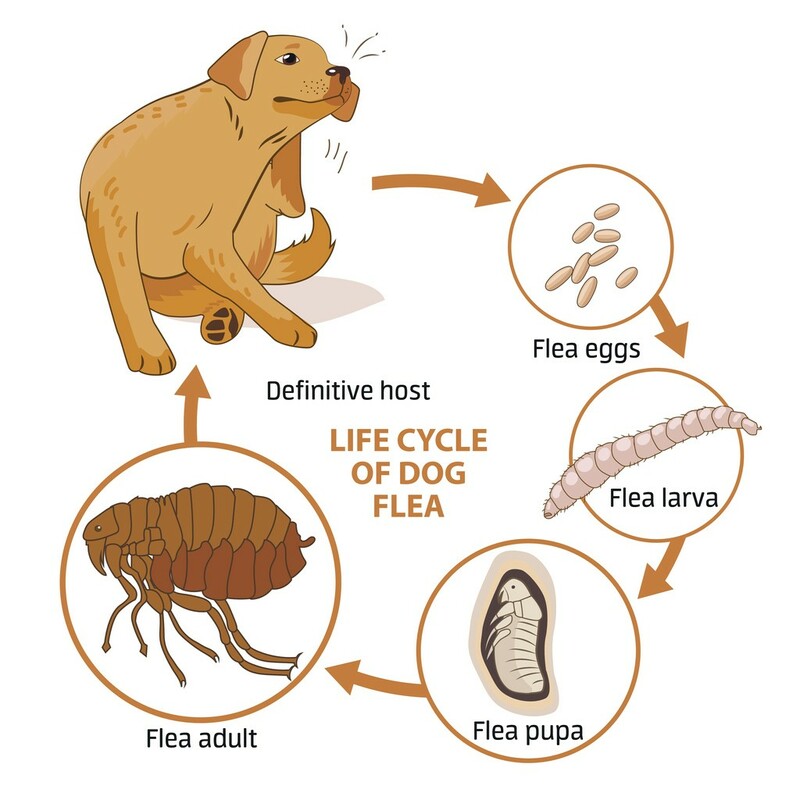 IT ALL STARTS WITH A FLEA BITE..
FLEAS ARE EGG LAYING MACHINES! UNDERSTAND THAT YOU CANNOT KILL FLEA PUPAE!!! MAKE SURE YOU USE EVERY ROOM AND DO NOT LEAVE THEM VACANT! Fleas are one of the most persistent, nasty and tough to kill insects known to man. True, fleas are small. But any level of an active flea infestation can make the people and pets living in the area miserable. If you’ve wondered why this creature is so “hard to kill”, read on. This article will explain the flea in great detail and only then will you understand why they are so hard to rid a structure of them once they get a foothold inside. Like most insect control, successful flea control must include a flea treatment that will stop the flea “cycle”. This cycle I am referring to includes the eggs, larva, pupa and adult stage. Here is a brief description of the cycle from start to finish. Extreme case of flea bites on humans. 1) An adult flea jumps onto you, your pet, your child, etc. and gets a good blood meal. 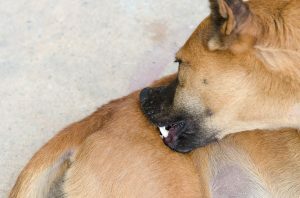 Fleas feed on blood and although their mouth is small, a flea bite can hurt and most certainly can become inflamed, itchy and swollen. Many people and many pets are allergic to flea bites. Like most insect bites, some people are exceptionally sensitive to flea bites and others won’t feel or even notice irritation. Fleas need a good blood meal to reproduce and once they reach adulthood, their quest for a good meal will be their only purpose. In the yard, fleas will lay in wait surviving through the harshest weather winter will bring. Once spring arrives and temps warm, adults will hatch from pupae to start new life cycles. Where they start is pretty much random. So if you pass by a flea waiting to feed, you will be their target. So its not that fleas target cats or dogs as much as they target mammals. And fleas aren’t specific to animals so a cat flea will readily bite a dog or human. 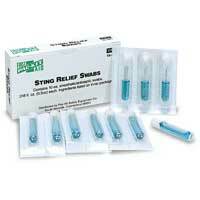 Now if you have flea bites and need relief from their itch, apply STING RELIEF SWABS. This product will take away both the itch and discomfort. 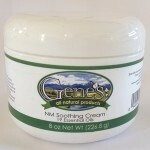 For old bites taking too long to heal, get GENES SOOTHING CREAM. This all natural ointment will help expedite the healing process for skin that’s been torn up from fleas and can be used dogs and cats as well as people. Now for anyone who keeps coming in direct contact with fleas when working or if you’re forced to spend a lot of time in a yard or home currently infested, use a flea repellent to keep them off your skin and clothes. There are very few products labeled for fleas but we have one formulation, and it works great. Known as BUG OFF AEROSOL. , this aerosol can be sprayed on your clothing and skin as needed. In general, one application in the morning can last all day but if you’re in the yard sweating and its hot, you may need to renew the application after lunch. 2) Once the adult females get a good meal, she’ll start looking for mate. And after mating, she’ll start laying eggs. She won’t be doing a lot of traveling during this time. In fact, the whole cycle (biting, feeding, mating and egg laying) can occur right in your yard, your home or on the pet. 3) In the next two to three weeks, the average life of a flea, hundreds and hundreds of eggs will be laid by any one healthy female (see picture to the right). Some of her eggs can fall in the yard, some in the house and some will remain right on your pet if that’s where she got her meal. 4) When the eggs hatch, a small caterpillar like creature comes out to feed on anything organic (see picture to the left). This includes dried blood, flea feces, animal hair and a variety of otherwise disgusting organic matter in the yard, in your carpet, on furniture, on your pet and basically anywhere in or outside the home. 5) These flea larva will then feed for days after which they’ll spin a cocoon and undergo metamorphosis in this stage. And it’s this third stage, the one called the flea pupa, which is the big problem when dealing with any flea infestation. Clearly this is the worst stage of all because we can’t kill it !! That’s right! No spray will kill flea pupa consistently or completely. This is why you still have fleas following the most thorough treatment (spray or fog). And this is why you should do a thorough job and if hatching flea pupae come back strong in a few days following a good treatment, don’t be surprised. All this means is that you should treat again and again until you effectively “use up” all the pupae. Only then will the cycle finally end. 6) The flea cycle will then complete once the flea pupa hatches out. But unlike most insects, fleas won’t randomly hatch. Instead, the “hatching” of pupa will only happen when it detects a hot blooded meal close at hand. Only then will the pupa risk coming out of its protective cocoon. And when it does, it will immediately bite, feed and look to breed. At that time the cycle will start all over again…. Now that you understand the flea cycle, let’s talk about where the flea cycle can occur. It’s important to understand this process if you wish to do a good flea treatment. Well guess what. The flea cycle can occur almost anywhere. No doubt it can occur on the animal, in the yard, in a carpet, in a litter box, in a bed, in a garage, in a basement, in a crawl space, in an attic, in a doghouse, on furniture, etc., etc., etc. The rule here is simple: any place a warm blooded animal spends time can become a flea infested location. And it’s important to understand that fleas can feed on most any animal that’s warm blooded. In other words, fleas do not discriminate. If you have blood, they can and will feed on you if given the opportunity! This means they will readily bite people so yes, you can have a flea infestation AND NOT HAVE ANY PETS! It is true they prefer dogs, cats, squirrels, raccoons, chipmunks, rats, mice, and birds but if none are present, they turn their attention to people. Additionally, the most common flea found is the cat flea. But you could also have a dog flea, bird flea, rat flea, sand flea, human flea, sticktight flea, bat flea and many other species which have been named after the host where they were first discovered. The good news is that any flea treatment being done will work on any of the aforementioned flea species so the type you have is not important. Now that you know where the flea cycle can occur, it will be easier to understand what must be done to end the infestation. 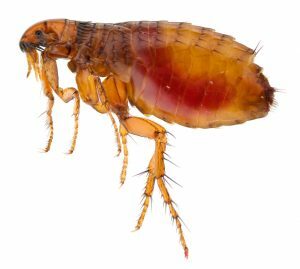 Remember, it is important to understand that fleas will persist if you only address one or two locations if the whole house and yard is infested. In other words, don’t think that treating the pet will keep your home or yard flea free. The same is true about the yard. Although treating the yard before flea season starts is a good practice, only treating the yard and pet but failing to treat the home would be a big mistake as well. 1) If the pet is an inside animal, you must treat the home and the pet to insure no fleas. 2) If the pet is an outside animal, you will need to treat the pet as well as the yard the pet frequents. 3) If the pet spends a lot of time both inside and out, then you will need to treat the pet, yard and the home. * If you are spraying two of the three areas but fleas are still persisting, then chances are that you need to treat the location where you are not treating. **Always remember that FLEA CONTROL IS EGG CONTROL! IF YOU STOP THE EGGS FROM DEVELOPING ON THE PET, IN THE YARD AND IN THE HOME – YOU WILL ACHIEVE FLEA CONTROL! These are all old wives tales. The bottom line is simple: treat all areas which are subject to having flea eggs and you won’t have to worry about the eggs being able to develop. Again: FLEA CONTROL IS EGG CONTROL. Once infested, a proper flea treatment will generally take 1-2 months to rid any structure of fleas. 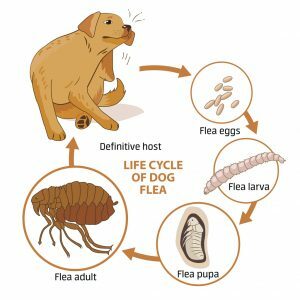 If done correctly, the cycle would be interrupted with the first flea treatment and once the flea pupae have all hatched out, the flea infestation will cease. Will this take a week, a month or two months? 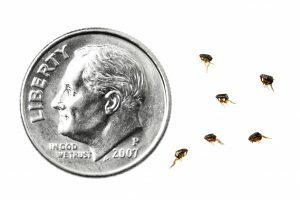 No one can say for sure because of one reason: it all depends on how many flea pupae are in your home and how long it takes for them to run their growth cycle and hatch out. It could be resolved with one flea treatment; it could take three to six weeks of flea spraying once a week for all the cycles to run their course. So what are the best products to use when doing flea control? This will vary depending on where you are treating. We have over 30 years of experience helping home owners treat the worst flea problems known to exist so we’re confident in our recommendations. The next segments of our article will detail products specific for the home, the yard and the pet. So whether you have carpets, hardwoods, tiles or cement, we know what’s best to use on any given surface and will explain in detail below what you need to use, how to mix it up, how frequently you’ll need to spray and how to it applied. In most scenarios, once you have active fleas you will best served spraying a liquid formulation. This form will provide the quickest results. And for carpets, its usually the best way to deliver the product where it will be needed. Liquid treatments should include two actives. The first is the adulticide, designed to kill adults and larvae. 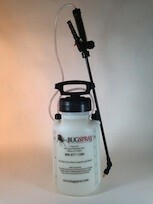 The second component is the “egg killer” or what we call an “insect growth regulator”. 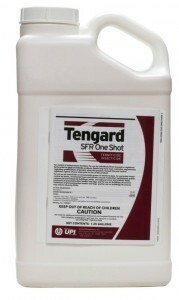 For the adulticide part of the spray, Permethrin is the way to go. Odorless and very to safe to use around mammals like people and pets, we have two strengths available. These mix with water and can be sprayed over carpeting, furniture, drapery and pretty much any fabric where fleas might be active. For small homes, 1500 sq/ft or less, our 10% PERMETHRIN can handle the job. Add 6 oz per gallon of water and plan on covering 750-1000 sq/ft per mixed gallon. 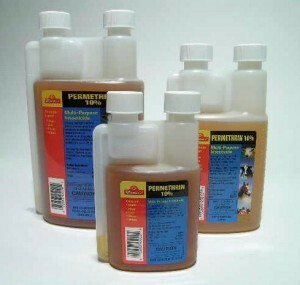 For larger homes or really bad infestations, get our 36% PERMETHRIN. 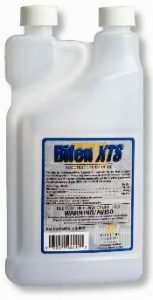 Mix this at the rate of 2 oz per gallon of water and plan on getting 750-1000 sq/ft of coverage per gallon. As stated above, you need to add an insect growth regulator to the Permethrin. For the longest time, PRECOR was the “best” option to use but in our experience, you’ll get better results with NYLAR. First, its always good to change actives – especially if you’ve been using the same one for many years. Second, Nylar works on many other insects and not just fleas. Nylar works the same way as Precor; add 1 oz to the gallon with either Permethrin listed above. The two are designed to be mixed together and should be applied at the same time. Nylar will effectively work on eggs causing the hatching larvae to develop incorrectly. Ultimately this leads to them dying before they can reach adulthood and their reproductive stage. 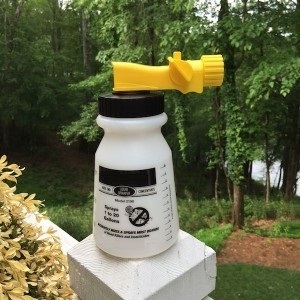 For severe problems or homes larger than 2,000 sq/ft, the 10% NYLAR will prove more economical as you only need 1/4 oz per gallon of water added with either Permethrin listed above. To get your spray applied, you’ll need a good PUMP SPRAYER. Our private label is super durable and with the included nozzle selection, able to deliver the spray as needed to get the job done. This short video shows the kind of “spraying” you’ll need to do to get the job done correctly (please note the video shows us using our old, discontinued sprayer. Our new private label sprayer above will do an even better job). Now as good as these products are, its very likely you’ll need to treat sometime soon following your first application. 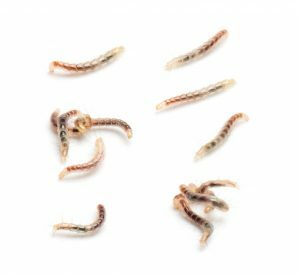 Whether or not you should will depend on how many flea pupae are left in your home following the initial treatment. One or two pupae hatching in the days following the first treatment will usually go unnoticed. But if you have a big problem and in turn, a mass hatching of developing pupae 1-2 weeks after you first treat, it will get bad again for sure. The general rule is plan on spraying as needed. Certainly once a week for 2-3 weeks is not unusual. And in really, really bad cases, twice a week. But for most homes, one treatment followed by another two weeks later will get things under control. When you do your first liquid treatment with an adulticide and a growth regulator, the adulticide will kill the adults and larvae which are out and about. The growth regulator will act on existing eggs and once they are exposed to the regulator, they will not be able to develop normally to adults. However, there will still be developing pupae. These could take another 4-8 weeks to fully grow and hatch. Sadly there is nothing that can be done to stop this from happening. The exact length of time the pupae in your home will vary; it all depends on things like temperature, humidity, the species of the flea living there, etc. But there are some things you can do to make the problem more manageable.. Since pupae are motivated to hatch when they sense activity around them, be sure and keep people and pets active in the rooms where the flea problem is the worst!. Flea pupae are motivated by movement and body heat. They will not hatch if a room is void of activity. In fact, one way of getting them to hatch quicker is to use a vacuum as often as possible. Daily vacuuming will excite them and get them hatching sooner rather than later. Another way to get them to hatch sooner is to walk around in long, white, tube socks. The white will reflect light and in turn, appears to be a hot target to a developing flea cocoon. Immediately after walking around for awhile, vacuum. The effect of vacuuming and the spray in the carpet will knockdown that many more fleas which will not be able to bite. Additionally, the vacuum will actually pick up some that hatch as the vacuum passes by. Do this every day til you can do so without seeing any fleas. 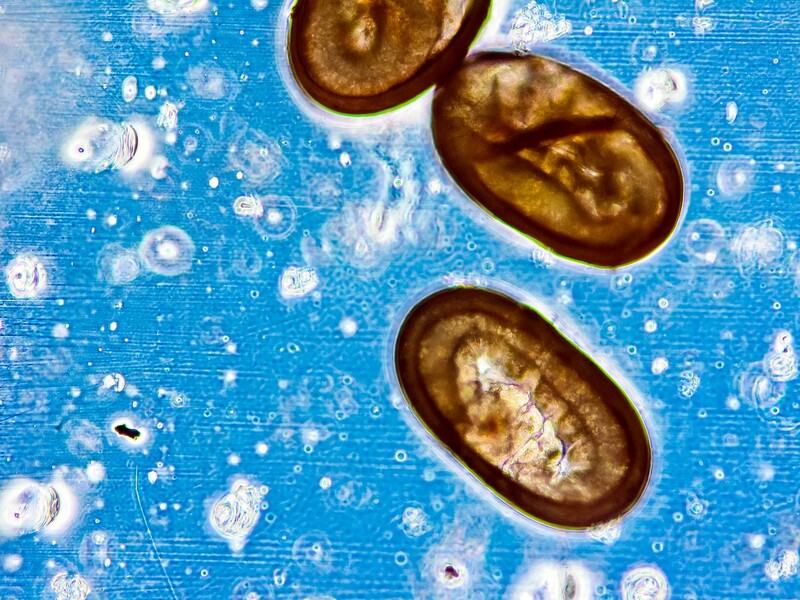 And remember: FLEA COCOONS CAN LIVE OVER A FULL YEAR WAITING FOR A TARGET BEFORE HATCHING! This is why vacation homes that have been left vacant for 8-12 months have been found to have hundreds of fleas hatching when vacationers arrive. The flea pupae have been doing nothing but lying in wait for a target the whole time. This cylce can happen in your home if you close a room for a month or two expecting the fleas to die off. Don’t waste your time waiting; all that will happen is that when you finally go back into the secluded room, the fleas will be extra aggressive! 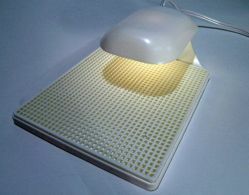 Another way of getting the flea cocoons to hatch sooner is to install HEATED FLEA TRAPS. These traps are unique in that they use heat to lure adult fleas and will actually get pupae stages to hatch. Look at flea traps as a type of tool and not as a treatment. When traps are placed in the middle of an infested room, they will lure fleas from up to 15 feet away in both directions. This means one trap has an effective “reach” up to 30 feet. One trap will cover up to 400 sq/ft. This is a room that’s about 20 feet wide by 20 feet long. But if you have a trap in a room just 10 feet by 10 feet and it has but one door to enter or leave, the trap will only work in this one room. Now if you place a trap out and don’t catch fleas after 3 days, move it about. In general, plug the trap in to the wall an use the included cord to set it away from the wall and out toward the middle of the room. To understand how the trap works, imagine what it looks like to the flea. Since they see infrared, they perceive the trap as a little kitten or puppy sleeping. The following video provides product details on this trap. Contrary to popular belief, fleas do not like to hop. That being said, they will readily move toward the trap. Once fleas reach the trap, they will fall through the grid surface top side and stick to the glue board underneath where they will be held tight. Here is a picture of a flea pad from a trap that captured over 10,000 FLEAS in less than a month! Granted this was a bad infestation. But it did exist and the people living there were unaware it had gotten to this point. 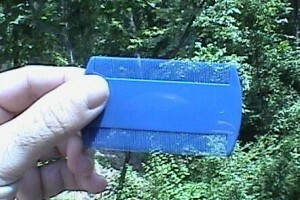 The sheer number of fleas on this glue pad confirms that fleas can breed to an incredible density if given the chance. 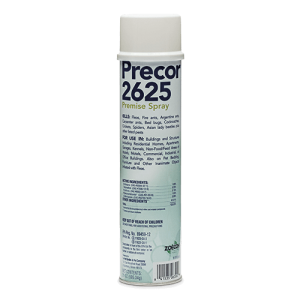 Since tiled, linoleum or hardwood floors can be “messy” to spray with a liquid, you’ll be better served by instead using PRECOR 2625 AEROSOL. This product is ideal for any place you don’t want to spray with a liquid. To treat, hold the spray around waist high and start in a corner of any room. Lightly mist it out like hair spray working the can back and forth as you exit the room. The can will release a light mist which will cover the floor with enough product to both kill adults and stop developing young. When used right, the treatment should appear to be dry. Precor is odorless and should not be noticeable but give the area a good 2 hours to do its job before walking over treated surfaces. Precor works well on surfaces other than carpet to and again, allows for a clean application without making a mess. One can will cover up to 2625 sq/ft and can be used as needed. Plan on retreating once a week until the problem is gone; use it every 3 months to ensure fleas don’t return. If your flea problem is in a garage or basement, liquid sprays won’t be effective when applied to cement. Same is true for areas with dirt floors. And though Precor 2625 is well suited to prevent them from getting established in such locations, it’s not the best at knocking out a current, active infestation. So for cement or dirt areas like crawl spaces or under a deck, go with DRIONE DUST. This desiccant acting dust looks a lot like baby powder. 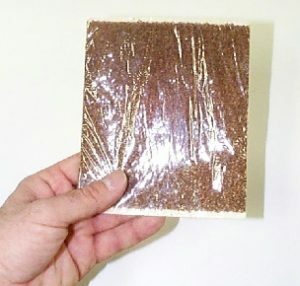 It’s well suited for areas like dry cement, crawl spaces and places where liquids get absorbed. Drione is actually a solid dust and unlike a liquid or aerosol, won’t break down quickly or get absorbed leaving the fleas behind so they can do as they want. Instead, a good application of Drione to a crawl space or cement floor can last 6+ months and it will constantly be “drying up” all stages of the fleas ending their reign that much faster. Use 1 lb for ever 1500 sq/ft of area. For cement floors, lightly sprinkling some out and then using a broom to push it over all surfaces is a good way to get it applied. Be sure to wear a dust mask as Drione will cause you to sneeze. 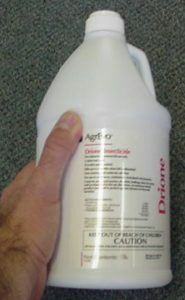 The only drawback to using Drione is that it will leave a light powdery residue where applied. Though not dangerous, its messy. Like baby powder you’ll be tracking it around if you walk over the treated area. That being said, if you have a garage or some other porous surface area infested with fleas, there isn’t anything better to use compared to Drione. Our best advice is to let it stay as long as you can, like 2-4 weeks, and once the fleas are gone, you can remove it. Removing Drione can be done by mopping with nothing more than water. When water hits Drione, it will be completely deactivated. It can also be removed with a good vacuum but this can cause it to get airborn which will cause most anyone to sneeze so be careful if you try to vacuum it up. Now that the home is being properly treated, you can change your focus to the pets. This is important since fleas can live their whole life on a pet. For this reason, its imperative the pet gets treated too. But its important to understand that treating the pet alone is not going to solve a local flea problem. The main reason for this that flea eggs can grow and hatch in carpeting, on furniture and in the yard. And as your pet moves around the home and yard, flea eggs will be dropping to the areas it visits. So even if you’re applying a topical treatment to your pets skin or if the pet is taking some kind of monthly pill, this is just one part of the flea treatment process. You see, pets that are treated this way will still be picking up fleas from the home or yard. And even if these fleas won’t be able to lay eggs, they will be able to bite making your pets life miserable. Additionally, it will only take 1-2 fleas biting a person (who isn’t being treated) to cause an infestation in the home! In the end, treating the home and pet is the least amount of work you should expect to do when battling this pest. And if the pet spends any significant time outside, treating the yard will most likely be required too. 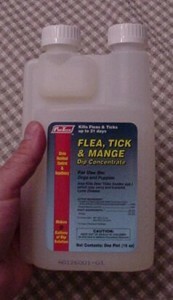 So for a pet heavily infested with fleas (dogs only), dip them first with FLEA TICK MANGE DIP. 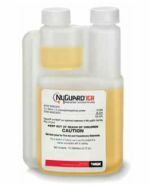 This Permethrin based dip is odorless, fast acting and a great way to “purge” the pet once the home is properly treated. Add 4 oz per gallon of water and get the solution applied using a rag or sponge in a controlled environment like a bath tub. Let the pet be for 1-2 days following the dip and then shampoo them with TRIPLE PYRETHRIN SHAMPOO. This shampoo will clean the pet and it has an amazing fresh smell that is “salon” like. Triple Py will kill any fleas the dip missed plus it will help by removing pet dander flea larvae like to exploit. After 1-2 days following the shampoo, use a FLEA COMB. to help remove anything still on the animal. This fine tooth comb will help identify any lingering problem as well as remove hundreds if not thousands of eggs and pupae which one could easily miss. After a week following the initial dip, give the dog a good look over to see if the fleas are coming back. If you find a significant amount of activity, start the process over by digging and shampooing. Also, be sure you’re treating other key areas like the home and yard. 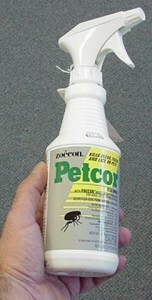 Once you can go a week without finding fleas on the pet, start spraying it with PETCOR . This ready to use spray will not only kills adult fleas but it can also kill flea eggs! For this reason you should get used to applying it every 3-4 weeks if you would like to prevent another flea problem from ever developing. The Flea Dip above is actually quite gentle since it only uses permethrin for an active. 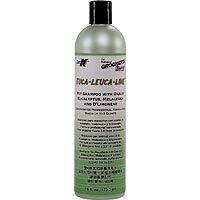 But if you already have the fleas removed from your pet and are reluctant to use anything which may irriate their skin or fur, try MELALEUCA SHAMPOO. This shampoo will help by washing away pet dander and removing flea feces. Plus the melaleuca helps by soothing the skin and fur and by promoting the healing process. 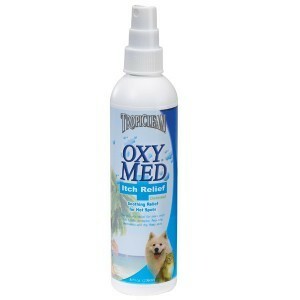 And if your pet is already suffering with itchy, dry skin that doesn’t seem to heal, get some OXY MED ITCH RELIEF SPRAY. This ready to spray comes in a small spray bottle and works immediately by removing the itch and calming your pet down. Use it as needed; treating your pet several times a day with a few spritzs will not hurt it and if anything, help to ensure faster healing time. Ideally, once your pets skin is healed, you should try using the Petcor above to ensure fleas don’t return. But Petcor uses an alcohol base which can be irritating to some animals. But not treating your pet would be a big mistake too so if you don’t want to risk irritating your pet with Petcor, consider this WATER BASED PERMETHRIN SPRAY. True, this spray does not have an egg killing agent. But its gentle enough to use as frequently as needed since it is water based. And unlike the Petcor which only leaves the Precor behind when you spray, this Permethrin spray actually leaves a residual on the animals fur to help keep fleas, tick and biting flies away. Designed for use on horses and other “show” animals, it also contains special fur conditioners which will help keep the skin well maintained. Last but not least, don’t forget the yard. True, most flea problems can be traced to the pet and the home. But if you go out in the yard and find fleas on your legs or clothing, its definitely time to treat. Like the home, if your pet spends time outside fleas will actively breed in these areas. Remember to your yard is vulnerable to every animal that walks through it. Animals like squirrels, raccoons, opossum, deer, dogs, cats, mice, rats, birds, chipmunks and even other people can all bring an egg laying flea around and this is all it takes for a problem to develop. So to stop an active flea problem or prevent one from starting, get the common area of the yard treated with BIFEN G. This granules is “sand like” and goes a long way. When applied properly, a 25 lb bag will cover up to 18,000 sq/ft and not be noticeable in the turf. Bifen needs to be activated with water to start working. You can rely on the rain to start releasing the active but if you have fleas already, water them in using the spray below. Use 1.5 lbs per 1,000 sq/ft. And plan on treating once a month when fleas are active; once gone, treat once every 3 months to ensure they don’t return. You’ll need a good GRANULE SPREADER to get them applied evenly. 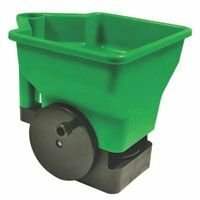 Any walk behind push type lawn fertilizer spreader will work. For small areas around bushes and shrubs, our little hand held unit is handy. Once granules have been applied, you’ll want to spray over the top to get them activated. This is especially important if you have active fleas. For small yards, CYONARA RTS is well suited. It comes with it’s own sprayer so all you have to do is hook it to your garden hose and you’re ready to treat. 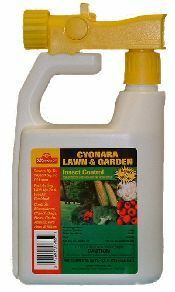 Cyonara is safe enough to use on vegetable gardens too so you basically can spray everywhere with it. One quart will cover up to 1/2 acre. When fleas are active and you’re seeing them out in the yard, plan on treating once a week until they’re gone. 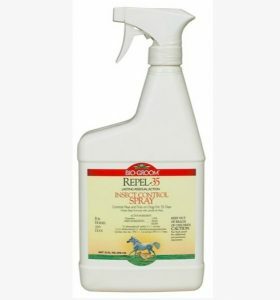 Once gone, treat once every 3 months with either this spray or the Bifen Granules (see above) and the fleas won’t return. For larger lots or really bad infestations, go with BIFEN XTS. This particular formulation is extra invasive so it does a great job of getting all areas where fleas might be hiding. Bifen can be sprayed most anywhere but its not for the vegetable garden. Use 2 oz in 5 gallons of water for every 5,000 sq/ft. Our quart jug will cover up to 2 aces so it goes a long way. Like the Cyonara, plan you treating every 2 weeks until the fleas are gone. Though you can use a pump sprayer to apply the Bifen, a HOSE END SPRAYER is really best suited. With our sprayer, you’ll need to add 2 oz of Bifen to the sprayer and then enough water to fill it up to the 5 gallon line. Next, hook it to your garden hose and use the entire amount to treat 5,000 sq/ft. For 10,000 sq/ft, you’ll need to add 4 oz and fill the sprayer half way to the 10 gallon line. Remember, flea season will be a long, miserable time if you don’t do a few preventive treatments before the season starts. With fleas, an ounce of prevention goes a long way. Treat your yard with granules before fleas get active. This alone can keep them out of the yard. In the home, spraying with Nylar before fleas get active can keep the home flea free most of the year. 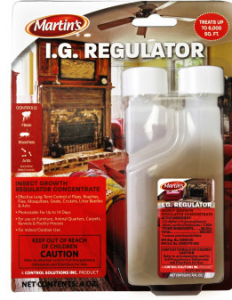 But if you already have fleas out in the yard, use both granules and liquid over the top to get control. And in the home, most any problem will require Permethrin and Nylar and possibly some Precor 2625 and Flea Traps. Lastly, plan on treating a few times to break the cycle if you have a bad problem. Once established, fleas can be tough to eliminate but if you follow this program and stay the course, you will eventually win the war.